The biggest threat to the integrity of environmental science is bad science, exaggeration and fear mongering. The recent hype about declining moose populations is just one more example of global warming advocates hijacking and denigrating ecological science. All organisms act locally, yet global warming advocates quickly characterize any local wildlife declines as the dastardly work of global warming. In northeastern Minnesota, moose populations reached an historic high abundance of 8,840 in 2006, and then rapidly declined to 4,230 in 2012. 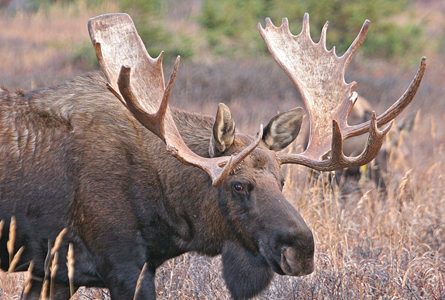 Most recently in a 2013-2014 survey, estimates dropped to 2,760 moose. Cause for alarm? Perhaps. But moose are a species known to naturally exhibit booms and busts when their habitat can no longer sustain a rapidly growing population. Instead of deeper discussions on the ecological complexities, but reminiscent of the fearful headlines that “children will no longer know what snow is”, the National Wildlife Federation (NW) bellowed “People never forget seeing their first moose. But due in part to the effects of climate change, it could well be their last. Moose are being hurt by overheating, disease and tick infestation – all tied to warming temperatures.” And to magically save the moose, the NWF encourages you to sign their petition to the EPA to curb CO2 emissions, and for just $20 to $50 you can adopt a moose from the NWF. Presumably the $50 moose is in its prime and carries fewer ticks. The Audubon Society similarly published Mysterious Moose Die-Offs Could be Linked to Global Warming and climate scientists like Michael Mann, who has hitched his scientific status to “dire predictions”, wrongly connect declining moose populations to rising CO2. There are so many reasons to be revolted by their fear mongering and its denigration of ecological science, it’s hard to know where to start. For instance, the greatest spike in moose mortality happens in March at the end of severe winters. Milder winters can be beneficial. While alarmists blame moose deaths on “global warming”, the rapid decline in northeastern Minnesota has happened in a region experiencing bouts of record breaking low temperatures. Nearby International Falls, MN broke its record January low of -37°F set in 2010, by dropping to -41°F in 2014, which followed December’s record setting 8 days with a temperature of less than -30°F. Averaging local temperatures is likely as useless as referring to the global temperature. Furthermore moose die?offs are not global. In adjacent habitat of southern Ontario, moose are stable or increasing. Estimates of moose populations have traditionally been based on hunters’ harvest and in Scandinavia, the annual harvest was less than 10,000 in the early 1900s. After a century of global warming the moose population reached an all time high with annual harvests increasing 20­?fold to 200,000. Similarly in the 1900s, moose from British Columbia expanded into Alaska and multiplied as the climate warmed. In New England, moose were more abundant than deer when the Pilgrims arrived. But due to deforestation for farmland and overhunting, moose have been absent from Massachusetts and Vermont for 200 years. In 1901 less than 20 moose were believed to inhabit New Hampshire. But in contrast to fearful global warming theory and species range, since 1980 moose have migrated south from New Hampshire into Massachusetts and Connecticut, despite temperatures that average 4 to 6° F warmer. Scandinavian biologists suspect the moose population may begin to decline, but their reasons illustrate the complex ecology. Increasing moose densities strain food supplies resulting in lower body mass, lower reproductive success, and lower resiliency. Moose thrive on vegetation common in regenerating forests that have been cleared by insect outbreaks, fires or logging. Scandinavian logging increased during the 20th century but has now peaked and will decline, and so moose will lose habitat as closed forest canopies reclaim the landscape . Except in eastern Finland, depredation by wolves has been minimal, but wolf populations are now rebounding. The best studied moose population exists just east of Minnesota’s northeast border on Isle Royale in Lake Superior and illustrates the boom and bust nature of moose populations. As moose populations globally expanded in the 1900s, they soon colonized Isle Royale around 1912 and rapidly grew to over 3000 by early 1930s. Rapid population growth diminished food supplies and a starvation crash happened in1934. Extensive forest fires in 1936 increased their preferred vegetation and feasting on young vegetation in a regenerating forest, the population rebounded until it peaked , followed by increasing winter starvation. 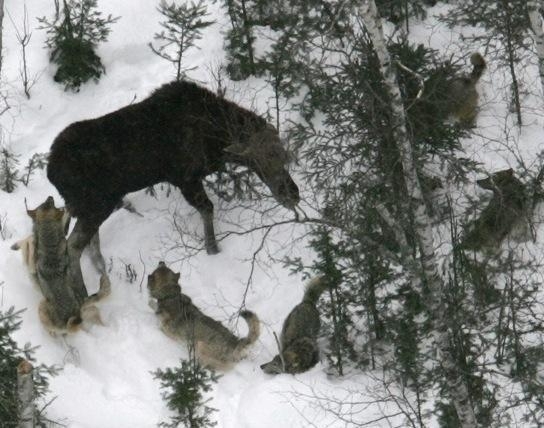 To add another factor governing moose population, in the 1940s wolves colonized Isle Royale. Virtually every college ecology text discusses the predator-prey interactions illustrated by the wolves and moose of Isle Royale. As observed elsewhere in the Great Lakes region, moose populations remained low until they began increasing in the 1950s. As seen in the diagram below, moose populations rose but also ebbed and flowed inversely with wolf populations. 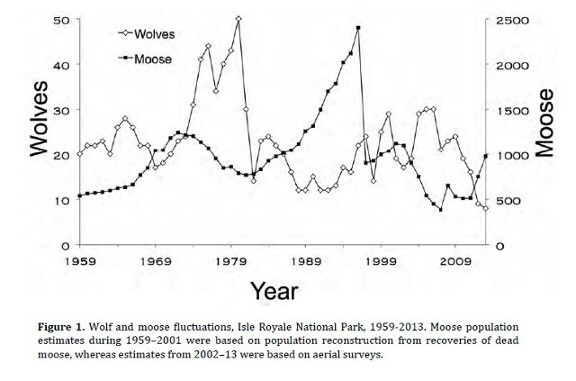 In contrast to suggestions that global warming is killing moose, during the rapid warming from the 80s to 90s, Isle Royale moose doubled their population, approaching a peak not observed since the 1930s, then suddenly crashing to just 500 in 1997. Moose have slowly rebounded since 2007 and are now at levels 50% higher than the 1950s. In response to the dramatic decline of moose in northeastern Minnesota, over 100 moose were equipped with radio-collars that could alert biologists to the moose’s impending death, allowing biologists to account for the deaths of 35 calves and 19 adults. - 13 calves (37%) calves died due to mother abandonment. Eleven were caused when the mothers abandoned the calve during the act of attaching the collars, 2 were abandoned later. - One calf drowned and 1 calf died of unknown causes. - Of the 19 adults, 10 (53%) were killed directly or indirectly by wolves. Oddly given those results, biologist received a new $750,000 grant to study the effects of “global warming” on declining moose. I suspect it is politically more convenient to blame declining moose on global warming rather than to blame natural boom and busts, rebounding wolf populations, or researcher induced casualties. Similar fear mongering blamed global warming for recent declines in New Hampshire’s moose. On a PBS Newshour, the interviewer interspersed interviews with researchers and Eric Orff of the National Wildlife Federation who insinuated that it’s all about climate change. Like the debunked claims of Parmesan that global warming is killing animals in the south, Orff highlighted dwindling moose populations on the southern end of their range, concluding, “we need to put this earth on a diet of carbs, carbon, and bring back winter.” But New Hampshire’s average temperature has little meaning. Moose can respond to temperature changes by moving to different microclimates. Between a gravel road, open shrub lands, ponds, and closed canopies of deep evergreen forest, temperatures will vary by 20° to 40°F. A mosaic of habitats is more critical than a 1° degree change in average temperature. In addition, Orff failed to mention that moose have been migrating from New Hampshire southward and thriving where climates averaged 4°F to 6°F warmer and winters are much milder. Orff also failed to inform the public about normal population boom and busts. New Hampshire’s moose population stagnated at fewer than 15 individuals since the mid 1800s and did not begin to rebound until the 1970s. As the climate warmed numbers exploded, by 1988 growing to 1600, and then 7500 by the late 1990s. That increase resulted in more moose?car collisions and a public clamor for increased moose hunts. Perhaps because the public would be less likely to “adopt a moose” that needed to be hunted, Orff failed to mention that according to Fish and Game about half of New Hampshire’s recent population drop from 7500 to 4000 moose was due to a public safety management decision to increase hunting. New Hampshire’s remaining decline has been blamed on moose ticks, which some suggest have increased due to milder winters. Perhaps. But moose also survive better during milder winters. On average moose are covered with 30,000 ticks and each tick can lay a thousand eggs. When moose populations explode so do the ticks. Unprecedented tick abundance coincides with unprecedented moose populations. Besides biologists have observed such parasite?driven booms and busts for over a century. Growing up in Massachusetts, moose were unheard of so far south. We travelled north to Baxter State Park in Maine to canoe the streams with hopes of seeing moose. Moose are indeed sensitive to warmer temperatures, so why would moose migrate southward to a warmer region that was also experiencing rapid “global warming”. Homogenized data suggested a rapid warming trend but as an ecologist, I knew homogenized temperatures are worthless for wildlife studies because the process eliminates natural temperature variations and alters the actual mean temperatures. However I also understood that trends determined from raw data can suffer from changes in instrumentation and/or changes in location. So I looked for a USHCN station with no such changes. Only one Massachusetts station, West Medway (below), had not moved and did not change thermometers. I assumed it would serve as the best standard with which to constrain any trend adjustments at other stations. 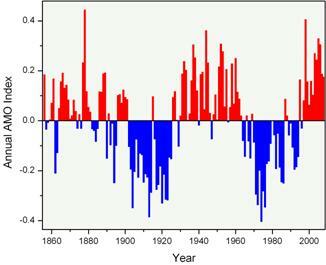 Yet West Medway was also homogenized (below on right) creating the same virtual warming trend. More importantly, West Medway’s raw minimum temperature trend had the same basic curve as the 2 western stations. The homogenization process for both NOAA and BEST creates a “regional expectation” based on similarities among neighboring stations, which in turn guides their temperature adjustments. But if USHCN stations are deemed to be of the highest quality with the fewest gaps and relocations, what data (likely much less reliable) was being used to re-create West Medway’s warming trend. If West Medway’s raw data shared similar trends with nearby stations, wouldn’t Medway’s trend be a reliable “regional expectation”? More troubling, the homogenization process undeservedly altered observed temperature peaks. Like Amherst, homogenization lowered West Medway’s 1950’s peak by 3 to 4°F, a lowering that was also applied to many other stations such as the Reading station (raw data left, homogenized right). So I was curious how the raw data from West Medway’s nearby USHCN stations compared and affected the regional expectation. The Blue Hill Observatory (below left) sits just 28 miles east of West Medway and is a historical landmark that has not moved. Its trend agrees with West Medway, peaking in around 1950 and then cooling until 1980. However after 1980, due to changes in instrumentation, it is not clear how much of the exaggerated rising trend is due to climatic factors (natural or CO2) or the result of a warming bias caused by new instruments. Taunton (below right) is located 29 miles southeast of West Medway. It too exhibits a peak around 1950 and a cooling trend to 1980. However once again the cause of the subsequent warming trend is obscured by the change in the measuring system. However there was one nearby station, Walpole that maintained the same equipment. Walpole (below) is situated just 12 miles east of West Medway and just west of the Blue Hill observatory. But Walpole exhibited a warming trend more similar to Massachusetts’ homogenized trend. Of which of those stations should anchor a “regional expectation”? Walpole’s raw data had an odd curve not shared by most of the other stations. 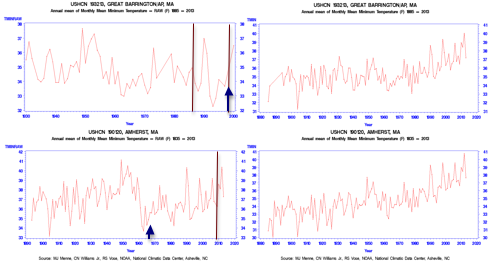 Although all stations experienced a warming spike during the 1972-74 El Nino/La Nina event, that peak was typically a degree lower than the 1950s. However Walpole reported an unusually higher 70s peak suggesting that after 1950 the weather station had moved to a warmer microclimate. But NOAA’s metadata did not specifically mention any relocation. Thinking I had missed that information, I rechecked. Although a relocation was not specifically mentioned, the GPS coordinates revealed a significant move in 1973. Yet comparing the raw data (below left) to the homogenized data (below right red), Since 1915 Walpoles raw data remained un-homogenized. Did the warming bias from the 1980s instrumental changes, create a confirmation bias for Walpole? What I assume is a most reasonable method to quality control for a location change, I compared the differences between West Medway (the only unaltered site) and Walpole’s minimum temperatures before and after Walpole’s location change. Between 1905-1973 Walpole averaged 0.3596 +/- 1.07°F warmer than Plymouth. Walpole could vary between 2° cooler one year to 4.6° warmer another. This great variability is natural and expected. Depending on how far east winter storm tracks travel up the east coast, the battle line between cold arctic air masses to the west and warm Atlantic air to the east causes significant temperature changes. Depending on the depth and extent of the cold air mass, the overriding warm Atlantic air can cause different parts of the state to simultaneously experience rain, freezing ice, sleet and snow. After the station moved, between 1974-2004 Walpole temperatures averaged 2.89 +/- 1.29F warmer than Medway, but with similar year-to-year variability ranging between 1.5 cooler one year to 4.5 warmer another. It is impossible to adjust for such local variations. But to extract a climate trend, it is reasonable to subtract the difference in mean temperatures before and after the relocation. So I subtracted 2.53 F (2.89-0.35) from all Wapole temperatures after 1973 to create my “quality controlled” trend (blue) and plotted that against the USHCN homogenized trend (red in graph above right). Unsurprisingly Walpole’s “quality controlled” data and West Medway’s raw data exhibit very similar trends with peaks and valleys coinciding with the Atlantic Multidecadal Oscillation (AMO). So I more carefully checked the data from Plymouth about 52 miles to the southeast. Unfortunately data from the Plymouth weather station does not extend back to the landing of the Pilgrims, which marked the beginning of the end for moose in Massachusetts. But after adjusting for Plymouth’s 2 obvious location changes, in 1966 and 1990 (blue arrows), Plymouth’s “quality controlled” data revealed a trend very similar to West Medway and a “regional expectation” related to the AMO. Most interesting, once Plymouth’s location change was accounted for there was no instrumental warm bias. As discussed by Davey and Pielke, a warming bias if often associated with MMTS temperature instruments, because new instruments and a new location happened simultaneously. Insignificant location changes could cause a warming bias when weather stations were moved closer to a building and subjected to a warmer micro-climate. It is highly likely that due to its effect on storm tracks and competing air masses, the AMO can explain most of the east coast’s temperature trends in a manner similar to how the Pacific Decadal Oscillation controls the USA’s west coast trends as published by Johnstone 2014. Unfortunately this relationship has been obscured by a highly questionable homogenization process. To be clear, I am not suggesting a conspiracy of data manipulation by climate scientists. I am arguing that the homogenization process is ill-conceived and erroneously applied. Many local dynamics are overlooked by a one-size fits all digital make over. Monthly homogenization can amplify those mistakes and has changed trends from one year to the next (as discussed for Death Valley). Homogenization has failed to adjust for documented location changes, yet created adjustments to untainted data where none were needed. Before we conclude that global warming is killing moose and creating unusually warmer winters, we need examine more closely local dynamics and their relationship to landscape changes and natural ocean cycles much more closely. Understanding local micro-climates are more important that a nebulous global climate. While it may be wise to think globally all organisms react locally, as do all weather stations.